Nearly all our goods are sold as used or previously owned, unless listed otherwise. The only point of note is that the Salmon has been part filled with sand or similar and the hole in the base has had a coin glued over it. Collection in Person. Approximate Size. Age related crazing present mainly on the base. BNIB The RSPCA Collection John Beswick Orange Goldfish JBDP2. BNIB The RSPCA Collection John Beswick Orange & White Goldfish JBDP3. Beswick "Golden Trout" Fish Figurine No.1246. Designed by Arthur Gredington. In good collectable condition, nice clean and bright colours. Excellent condition. 我们正常运往中国 . Beswick "Trout" Leaping Fish Figurine No.1032. BESWICK CHINA DISPLAY PLAQUE / SIGN MINT IN BOX EXCELLENT CONDITION. BESWICK PERCH FISH 1875 - PERFECT! Designed by Arthur Gredington, this delightful example of fine Beswick was introduced in 1963 and retired in 1971. The Beswick Perch has a current book price of £550. Model 1875. Produced exclusively for UKI Ceramics Limited in 2006 in a worldwide limited edition of only 500. This is number 106 of 500. Here for sale is a lovely John Beswick Goldfish. BESWICK AND ROYAL DOULTON HORSES AND ANIMALS LISTED WEEKLY. In Orange Gloss Finish. This is a gorgeous lifelike model. New in it's original box. Here for sale is a lovely John Beswick Goldfish. BESWICK AND ROYAL DOULTON HORSES AND ANIMALS LISTED WEEKLY. In Orange and White Gloss Finish. This is a gorgeous lifelike model. New in it's original box. John Beswick RSPCA Collection. RSPCA Pet Pals Collection. Every piece has been lovingly hand painted with colours that skilfully brings life to each beautiful sculpture giving instant visual and tactile appeal. Wade - Pin Dish - Fish / Trout - VGC. Beswick Oceanic Bonito 1232 -Rare- Gloss finish. Beswick Pottery England. It carries the Beswick England circular stamp to it's base along with the impressed wording - Beswick England 1232 Oceanic Bonito. BESWICK ENGLAND. IT CAN BE COLLECTED FROM MILTON KEYNES MK158AJ. As photos and condition report. Beswick TROUT Fish Model Figurine 1032 by Arthur Gredington . Dispatched with Royal Mail Signed For® 2nd Class. Beswick "Trout" Leaping Fish Figurine No.1032. . A stunning model of a Trout by Beswick. The figure is in brilliant condition and stands at about 6" tall. The trout was designed by Arthur Gredington and was issued from 1945 to 1975 and the model number is 1032. Beswick "Large-Mouthed Black Bass" Fish Figurine No.1266. Designed by Arthur Gredington. In good condition, nice clean and bright colours. 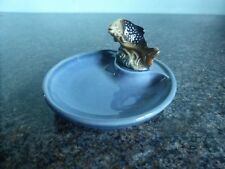 VINTAGE (WADE) TROUT FISH RING/TRINKET DRESSER TRAY/DISH - MINT CONDITION. Mint condition. No cracks or crazing. Black base. Wade marking on base. Made of porcelain china and marked Beswick on the base. Designed by Arthur Gredington. In good collectable condition apart from one of the fish fins is broken. See fourth pictures. Beswick England. more Beswick listed inc other trout. IT CAN BE COLLECTED FROM MILTON KEYNES MK158AJ. By Beswick (1032). Leaping Trout. Size: 7" (18 1/2cm) Tall Appx.